SAN FRANCISCO, CA (KTRK) -- J.J. Watt has won The Associated Press NFL Defensive Player of the Year award for the third time. It was not a unanimous selection for the Houston Texans defensive end, as it was last year - a first for the honor - but it was decisive. In tying Hall of Famer Lawrence Taylor as the only players to take the award three times, Watt earned 37 votes from a nationwide panel of 50 sports writers and broadcasters who regularly cover the NFL. Rams tackle Aaron Donald received seven votes, followed by two Carolina Panthers: linebacker Luke Kuechly with four, cornerback Josh Norman with two. Teammates, coaches, family, friends, fans, Thank You!!! Nothing I do would be possible without you. So extremely grateful. Congratulations to @JJWatt of @HoustonTexans--making history winning his third NFL Defensive Player of the Year award! Watt's superb fifth pro season for the AFC South champions included a league-high 17 1-2 sacks, eight passes defensed, three forced fumbles, one fumble recovery, and general dominance. 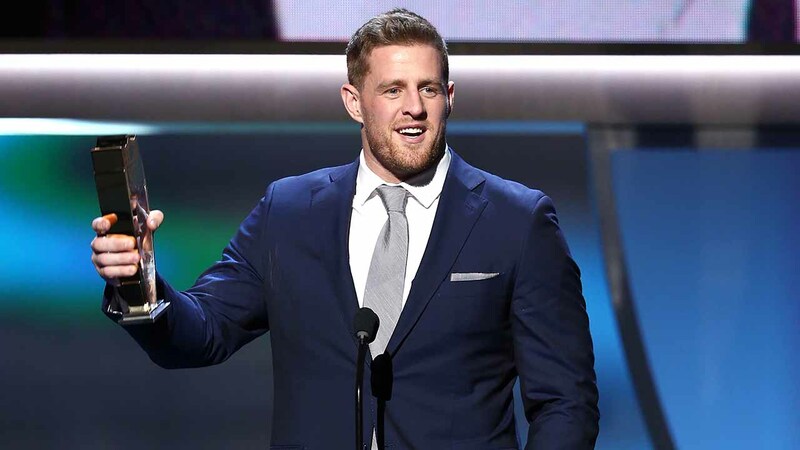 Watt received the award Saturday night at NFL Honors.